One hundred years ago, America had only just begun talking about "avant garde" art. Before the famous "Armory Show," no one was even using the term; after it, United States' art-watchers had many reasons to. It's what they saw on display at the exhibition, mounted by two dozen artists entirely without public funding. 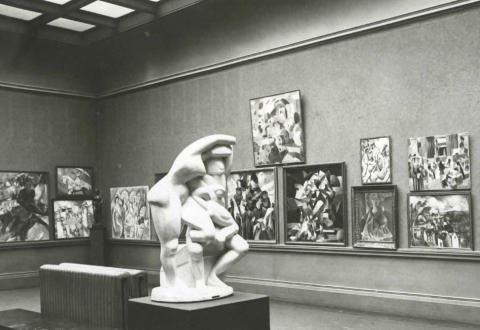 Properly called The International Exhibition of Modern Art, the show got its popular name by starting out in the 69th Regiment Armory on Lexington Avenue in New York. It then moved to Chicago and Boston, provoking shock, dismissal, and sometimes even appreciation across the East Coast and Midwest. A little Van Gogh, Gauguin, Cezanne, Picasso, Matisse, and Duchamp can do that to you. Or at least, they do that to you if you live in 1913 and have never seen such bold destruction and reinvention of visual art's established forms. To mark the Armory Show's centennial, the Art Institute of Chicago has recreated its viewing experience on the web. There you can explore the galleries as Chicagoans actually saw them a century ago, albeit in black-and-white. The site also provides much in the way of context, offering articles on the exhibition's genesis, program notes, legacy, and more. You can learn more about the impact of the Armory Show in this recent NPR piece, which quotes Museum of Modern Art curator Leah Dickerman on the subject: "It's this moment in time, 100 years ago, in which the foundations of cultural practice were totally reordered in as great a way as we have seen. And that this marks a reordering of the rules of art-making — it's as big as we've seen since the Renaissance."